If you’re going to live on any floor of a New York City townhouse, it may as well be the parlor floor as it’s usually considered the crown jewel of the home. This $1.2 million co-op occupies 1,000 square feet of an historic brownstone building at 61 West 68th Street. 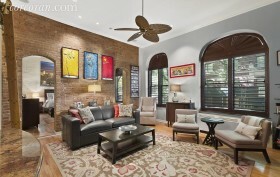 The exposed brick interior takes full advantage of the massive Palladian windows that line the apartment. The location, right off Central Park West, is nothing to scoff about either.